Click here to see our great clearance offers! 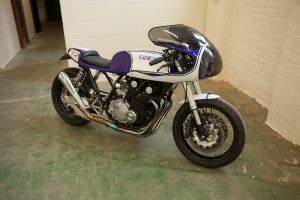 GS550 Cafe Racer built on one owner with only 7000 miles on it. 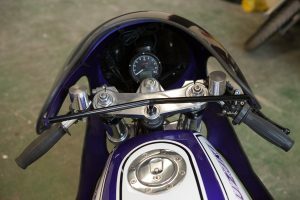 The bike was finished in Ford Metallic Imperial Blue with Blue and Purple Flakes in the Clear Coat. This bike is freshly built to showcase our products. 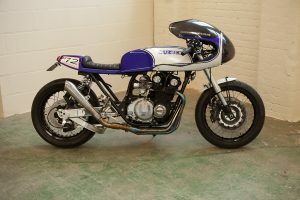 Everything on this bike is new including the Wheel Bearings, Headstock Bearings, Chains, Sprockets, Tyres, Twin Projector Headlights, Electronic Dash, Wiring Loom and an Undertray were all part of this bike’s makeover. 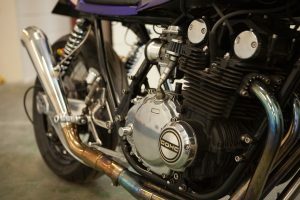 The Exhaust, Rear Sets, Frame, Swinging Arm, Yokes, Stand and all the Brackets were Powder-Coated in Gloss Silver while the Wheel Hubs and Rims were Powder-Coated Gloss Black and then re-laced with Stainless Steel Spokes. 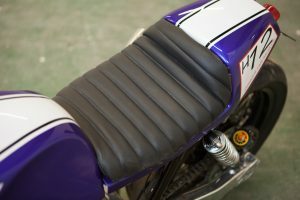 No expense was spared to make this bike breathtaking. 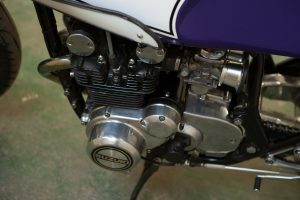 We built a big bore 673CC engine to go in the bike using the 7000 miles original bottom end. Here are the pictures we took along the way! 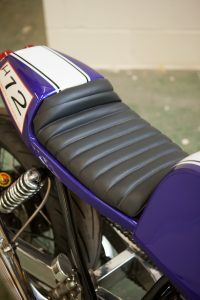 We made a specially designed seat for this bike using our Complete Cafe Racer Rickman Tank Cover & Complete Cafe Racer Avon Fairing. This was the first mock up. 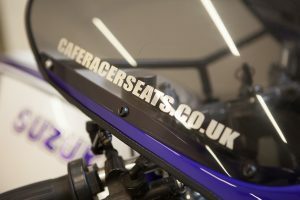 The Frame then had the Frame Rails shortened & Braced with Mounting Points added for the Fairing, Seat and Rearsets before being sent off to be Blasted & Powder Coated. The Frame then came back from Powder Coating & the Engine went in. 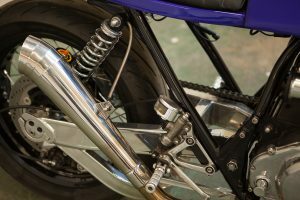 We replaced all the old rusty Steel items with brand new Stainless Nuts and Bolts. 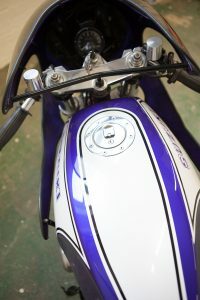 Once we finished the paint work in Ford Metallic Imperial Blue with Blue and Purple Flakes in the Clear Coat, the bike started to come together nicely. 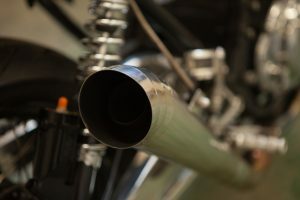 Shortly after, the bike was all finished and passed the MOT. 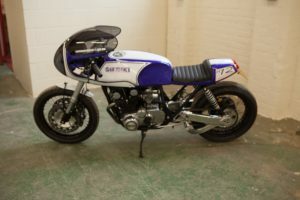 Well, at least we thought it were finished..
We quickly realised that this stunning bike was too nice to do on a budget. We forgot all about the budget and got back to it.. this time, we put everything into it! 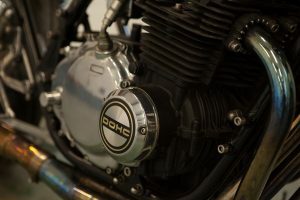 We began building a 673CC Big Bore Engine to give it the extra go that she deserves! We fitted this along with GSXR Slabby Flat Slide Carbs, GS1000 Metchemax Swinging Arm and SlingShot USD Forks to make room for the Spoked 5″ Rear Wheel and 3″ Front one. 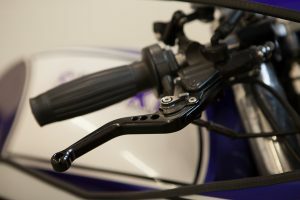 The brakes are Busa 6 Pot on custom Discs at the front and a ZXR400 Underslung Caliper at the back. 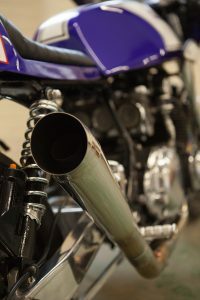 We replaced the standard Complete Cafe Racer GP Exhaust for the Complete Cafe Racer GP Mk2 Exhaust which our Head Mechanic nicely polished up for us! 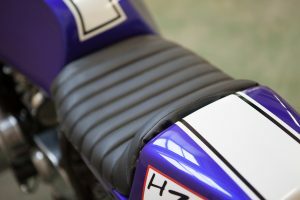 We swapped the Clear Screen and Clear Bubble on the Complete Cafe Racer Avon Fairing for Smoked ones and completely re-made the Seat Pad! After all this, something still wasn’t right. So we sent the Frame back off to the Powder-Coaters, but this time, it was to be done in Gloss Black. You now may recognise this beauty! It has featured in many magazines, been at multiple shows etc. 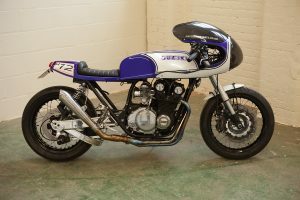 So after toying with this Bike for nearly 5 years, I still wasn’t happy. This bike is now really well known, and after featuring in multiple magazines, including 100% Biker, I decided it needed a new look. 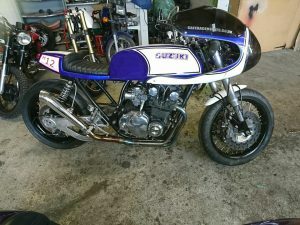 I am completely happy with all the parts used on the bike and how it runs, so all it needed was a paint job! 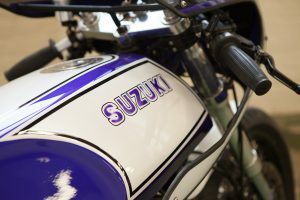 See below for images of the new GS673! 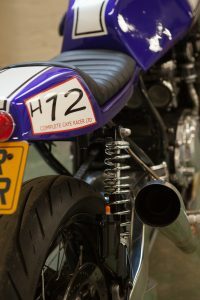 Throughout the build, this bike has had bits put on, and then taken off, and then put back on or completely changed. 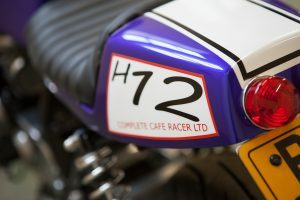 ©2019 Complete Cafe Racer Ltd. All rights reserved. Web Design by Your e Solutions Ltd.